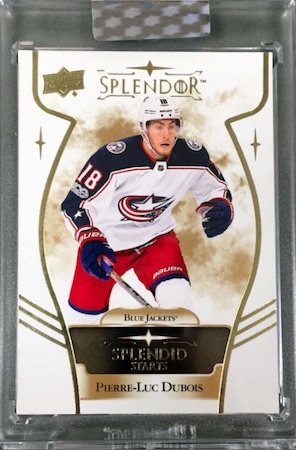 Moving to the hit-based format seen across the hobby, the debut for 2017-18 Upper Deck Splendor Hockey promises "one magnificent hit per box." Among the key points for NHL collectors, print runs are no higher than 36 copies, every card features an on-card autograph and/or quality relic, and all cards come in a one-touch case. 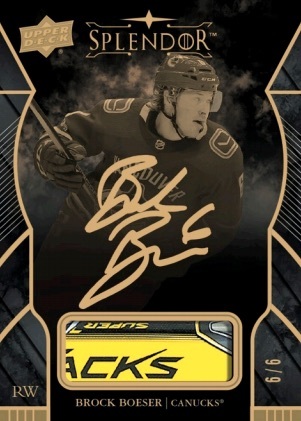 Occupying the largest percentage of the 2017-18 Upper Deck Splendor Hockey checklist, the base set works with 150 on-card autographs in Bordered (#/36) and Borderless (#/36) editions. Both also have Silver (#/22), Red (#/11), Gold (#/5) and Black (1/1) parallels. Other signed sets include Black and White Autographs that come in Silver (#/27), Copper (#/12), Gold (#/6), and White (1/1) versions, while the Showpieces auto relic breakdown features Silver (#/27), Blue (#/15), Gold (#/5), and Black (1/1) options. Another hard-signed choice is found in Splendid Signatures, issued in either base (#/24), Blue (#/15), Gold (#/5), or Black (1/1). The Auto Pucks (#/15) set obviously adds pieces of game-used hockey pucks. There is also a one-of-one parallel. 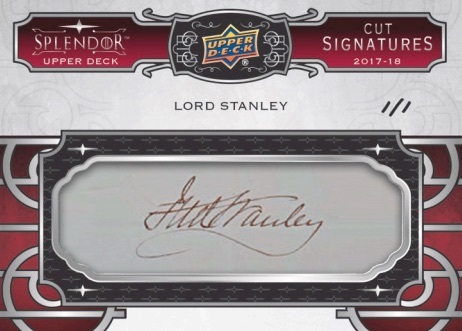 Highlighting NHL legends are the numbered Cut Signatures cards, including a signature for Lord Stanley taken from a 1879 military commission document, as well as Premium Materials Cut Signatures, and Signature Handles (1/1) cards, which contain a game-used stick nameplate. 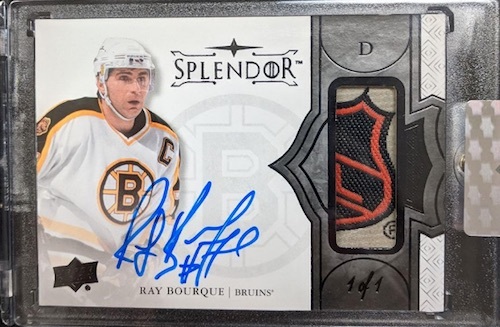 Although 2017-18 Upper Deck Splendor Hockey appears to be more filled with autographs, there are some impressive relics, as well. 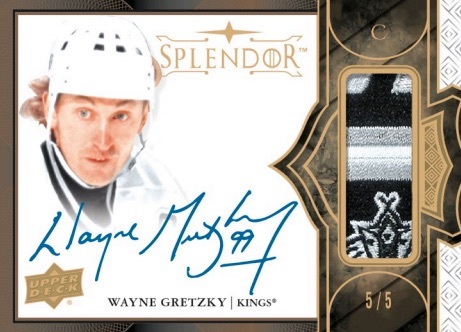 Splendid Swatches makes good use of a jumbo patch, and Silver Sticks (#/10) is reserved for those to play 1,000+ games. These limited cards have a sterling silver medallion shaped like a hockey stick. In fact, the only insert that seems out of place is Splendid Starts, which has no autograph, relic or listed print run. However, these are a bonus issued alongside a redemption. Connor McDavid 2017-18 Splendor Showpieces Auto Stick relic Black 1 Of 1 Nice !! 2017-18 UD Splendor Showpieces Mario Lemieux Blue Auto Stick tape 15 Nice!! 2017 18 UD Splendor TYLER SEGUIN Bordered Autograph Relic Gold #1 5! Buy 2017-18 UD Splendor NHL cards on eBay. 44 cards. Serial numbered #/36. PARALLEL CARDS: Silver #/22, Red #/11, Gold #/5. PARALLEL CARDS: Copper #/12, Gold #/6. 25 cards. Serial numbered #/15. PARALLEL CARDS: Blue #/15, Gold #/5, Black 1/1. 30 cards. Serial numbered #/24. 29 cards. Serial numbered #/5. 3 cards. Serial numbered #/36. 50 cards. Serial numbered #/10. 7 cards. Bonus card issued in boxes that have redemptions. See the full 2017-18 Upper Deck Splendor Hockey checklist spreadsheet. Set looks pretty cool. Things that can completely ruin it are price. I can see them charging 300 for a 1 card pack. Hope it’s 99 Canadian a box. The checklist is key. Is it full of today’s players 3rd and 4th liners or is it stars and lots of retired HHOF players. I really hope there’s lots of legends Upperdeck has gone far away from releasing legends in there sets. How bout putting another legends set out. Like panini did with classic signatures or what they put out during the strick in 04-05. I’ve bout 0 boxes this year due to what I think are poor checklists. Gave 3 stars till checklist arrives. I can see paying $200 plus a pop and pulling dud after dud rather than anything good. After looking at the gallery, spending top $$ and pulling a non numbered Karlsson auto?? I rest my case….. I think you mistaken on one of your points. You stated that might pull a non-number card like the karrlsson. That was a 1/1 card. I think all cards are limited to /36 or under. There are no NNO cards in the product. Still you will probably pull dud after dud of crap RCS as they are cheap to have sign. These cards look amazing. I would love to buy two boxes and get the Karlsson one of one and the Lord Stanley Autograph. For anyone interested you can purchase these type of cards from President’s Choice, the former ITG owner. I think the price point of 200 dollarssounds right. I will look forward to seeing what they go for after on Ebay. 150 base cards…hmmmm…Even low numbered cards, but only with one auto, don’t hold that much of a value. Besides, they say and I quote “Occupying the largest percentage of the 2017-18 Upper Deck Splendor Hockey checklist”. This means in a case, you’ll get a lot of base cards. True, they are signed, and low serial numbered, but it also depends of the players. I don’t know what to say about this product until I see the checklist. The cards look amazing of course, but they always show la crème de la crème before the release. I’m also concerned that some cards are not signed. A patch as beautiful as it may be, doesn’t hold to much of a value. Anyhow, will see once the checklist is released. great auto’s to have… you think your card is worth something. Then you realize there are the exact same auto cards just different numbered series. 1/1 3/3 5/5 10/10 etc…. if that happens good luck with this product having any REAL value!! I will be tuning into breakers.tv to see all the suckers that joined breaks of this product. To charge that much for one card with a 15% possibility of not getting an autographed card is crazy. 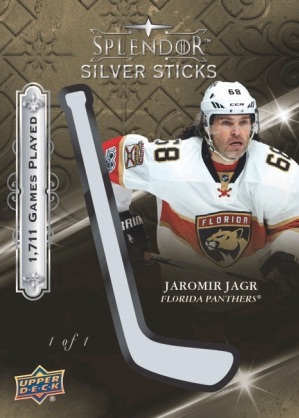 Oh, you hit a manufactured silver stick…lol. This is pure greed to put in non-autographed cards and charge that much for a box. UD wake up, maybe it’s time to concentrate on the collector and not the breakers you have such a close relationship with. By the way, this is no where close to being Topps Dynasty where you only get super LOW NUMBERED premium autographed hits. so UD is very happy..
get ready for some big kicks to the cahones here..
surely UD knows exactly where the bigger and best cut sign hits will fall to.. their breaker friends and stores who post on their hits twitter… so spend $20 to buy a cup before you break this – just for some protection. amazing how all the breaker online breaks dont get any cards numbered of 36…. but if I buy a pack.. I know what I must getting. within hours of release for a $200+ per single card pack – singles are already being listed for below $100…. listen for the snap crackle pow of the lo$$e$ mounting here..
you couldnt open up the window to show the entire NHL shield? That is so badly the worst embarrassment of making a High End card. spend big $$ and get a 1/1 shield card with the shield cut like that.. does that make it a 1/2?? As a collector on a budget this is the type of set way out of my price range. For only 1 card a box its crap you are not guaranteed a game used relic that includes the players autograph in every pull. I guess I’m just not the gambling type. disappointing that UD would even allow ONE single color swatch of any kind into this product. For this price point, UD has to provide swatches and sticks with something on them. cards are low numbered enough that a white single color swatch should NEVER happen. collectors are paying a premium for a premium product. Broke a case and pulled guys like Anthony Mantha out of /36. At $250 a pack for one card, that’s robbery. Weak checklist and not worth near the price point. Saw a breaker open a case for a hit draft. 11 out of the 12 cards were not worth $250, only one was a Gretzky auto. In fact, 6-8 cards weren’t even worth $125. But get this, the breaker actually said, “that was a great case!” If I was one of those 11, I would never break in that room again. There are breakers that will actually say it as it is but then there are breakers like this. I work for my money and really don’t need someone lying to me just to fill their wallet. Absolutely horrendous. Watched a break tonight and I actually thought about buying the Pens until the price got absurd. I will never even look at this product. The guy pulling said the Bowers auto was a sticker. Not a single card in the entire case was worth what one box was. The relics sucked. Outside of some smaller breaks for some entertainment on a boring night, I have completely stopped buying boxes. Seeing this box reassures me that I made the right decision. UD is a terrible company that produces a terrible, overpriced product. Someone else needs to get the license for me to even consider buying again. some of the cards look great but not worth the gamble. Cut Shields should be a crime just saying. single color white swatches at this price point is a rip off, basically paying 200$ for a one touch.Now that the lord Stanley has been opened I expect a dramatic price drop but still not worth it. The splendid starts look like a rip as well no signature/no artifact/, I’m willing to bet the young gun from series 1 & 2 will hold more value. Did this take over The Cup product.I can not find information on 2017-18 The Cup. UD has not released the details for The Cup yet. you should include a notation that the Splendid Starts are a bonus card included with every redemption. Okay, I am one of suckers mentioned above about who would drop big bucks on this product. I did. Kind of went crazy. Not proud of it but I busted 22 packs, one entire case and then the rest from a new case. In each case I got one of the NON numbered rookie cards, which is horrible that they are not numbered. Yes, you get an extra card when you pull one of these suckers but in both of my packs, one from each case it was for another NON numbered base card. That is a huge downer for sure. Collation was a problem as well. 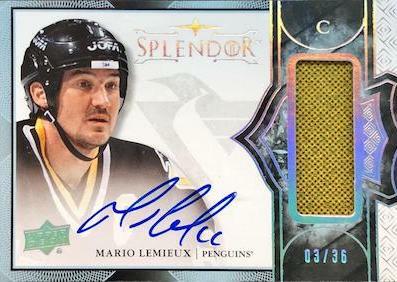 Two Guy LaFluer cards and get this three Mario Lemieux cards. Great players sure, but come on, that is beyond bad. I also hit one of the famous “silver stick cards” and while numbered to 10 it is basically a base card, no auto, nothing. Boo UD for not getting these at least signed. I also had the bad luck in pulling one color swatches and then some cards with a solid black puck. Topps Dynasty as least gives you a multi color swatch and at this price, UD should have done the same. So that pretty much sums up the bad. In the 22 packs, I did hit a nice patch of Tavares but it is an Islander so we know where that goes. The best of this entire purchase, was two Steve Yzerman cards. Splendid Signatures, with inscription 1/5 The card lists how many Cups he won with the Red Wings and sadly UD messed up as Yzerman screwed up the 98 when he was writing that. Never should have made it through quality control but it did. First case I broke it would be hard to even say what a case hit would be but in the very last pack number 22, I hit the best card of this break, a 1/1 Steve Yzerman auto patch. Great card and it should be as I finally pulled something that was great. Would I recommend this product? Maybe a pack if you only wanted an expensive thrill. I got caught up in thinking it had to get better, for the most part it didn’t. Would I buy again, NO, not at this level. Buy a pack, lose $100 bucks, take some big risk. Don’t we always think we will get lucky? Oh, the thrill. I gave this four stars, but the product does have room for improvement if ever produced again. I got lucky. My box had a Wayne Gretzky auto/2-Color seam jersey relic /36, but for the life of me, at this pricepoint, how can you justify putting in stand-alone relics, some of which are just one color? I paid $179 for my box … a discount … but watching these box breaks, I can’t see how UD justifies just relic cards. I saw a Red Wings relic, which was outstanding, but then I saw a Nolan Patrick relic that was one color, not even worth $20 probably. And no offense, but how do players like Norm Ullman (I know, he has 1,000+ points) and Roberto Luongo and Frank Mahovlich and even Tyler Seguin make this run at this price. Gilmour and Karlsson really have no business being in here. They earned their status on longevity not stats. They are not collectible players. You can make the argument that you have to throw in lesser players to keep the price at what it is, but for those people getting those boxes, it leaves a sour taste. Raise the price, put only stars … like UD Exquisite basketball (2011) to an extent, where you had a Jordan or Lebron both in a case almost all the time, and everyone is happy. This is high-end anyway. Only big collectors/dealers are in on this. Each card should have a relic attached, and it should be prime. I like the Splendid Starts rookies because they sell. But the autos attached are weak, Toews, Sakic, surprise someone once in a while and put a Gretzky or Lemieux or McDavid in there. Again, I liked the product enough to buy multiple boxes, I just wish the single relics and lesser names were … less. But overall, I think if you do hit big, you will be very happy, as I was. I have opened up 10 boxes of splendor from multiple cases. I cannot complain about my hits at all. I’ve pulled patch autos of Roy, Keller, Tavares, Crosby plus a true north signature of Gretzky. However, it is very hard for most cards to retain the box value. How could they leave out Autos of Matthews,Marner, Barzal, etc. No card should be a single color patch at this price point. I was looking forward to the Puck cards but tbh I don’t think any of them are actually game used. Every puck is plain black including the 1 of 1’s. How does SP game used have game used pucks with logos but Splendor has plain black everywhere. How could anyone even think about buying the cup when they can’t even get a 1 card product right. It would also be nice to label the Rookie cards. The one thing they did get right was add the splendid starts with the redemptions. The value in those boxes is more than most other boxes.